thank you for your interest in our Samba-wreck! In this blog I would like to inform everybody who is interested about the restoration of this amazing car. 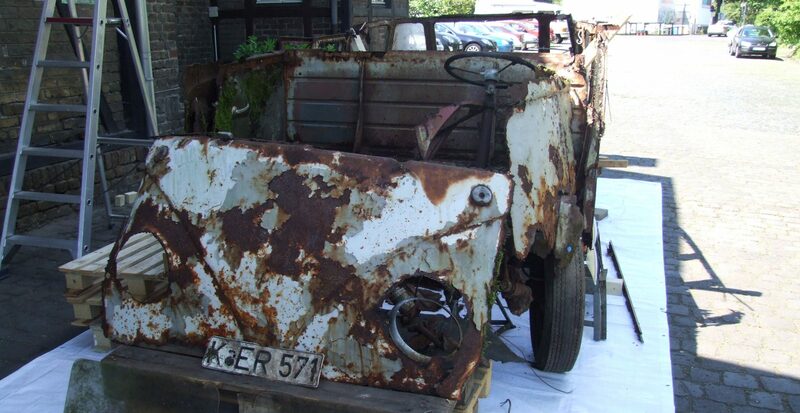 “Restoration” might be not the correct term as there is not so much left of the poor bus. We got an engine, a gearbox, a front axle, an ID-plate, some very rusty sections of the body and a few (but very interesting) parts. So we better call it a reconstruction. I will write the blog in English language, so more people can follow our project. Please excuse my funny English terms, I learned my English with Beavis and Butthead, so don´t expect Oxford level from my side…. As this is my first blog ever I have to learn how to use this. It might need a few days until I am familiar with this medium, but I will do my best to give you an update of the project weekly. So have a look in the next days and I will share with you our progress to bring back this Samba on the road. Have a good start in the week! Ich wünsche Dir viel Erfolg diesen 51er wieder auf die Strasse zu bringen ! Das wird ne Heidenarbeit ! Die “Hater” immer schön ignorieren.Den das ärgert Sie am meisten ! Good job rescuing this baby! I look forward to seeing your progress. I hope you can keep as much of the original 1951 Deluxe as possible. I applaud what you have done so far and you may be the man for the task! My own task bringing back a December 1955 Wolfsburg single cab pales in comparison. This is an immense project. Best wishes for a successful reconstruction. Best wishes with your reconstruction! And Beavis and Butthead is a fine way to learn English! Caution! This post may contain an offensive…. container! admblog on “You also have to clean the extinct volcanoes…. Dan on “You also have to clean the extinct volcanoes….